SEOUL, Korea February 24, 2013 - Samsung Electronics Co., Ltd, a global leader in digital media and digital convergence technologies, today announced the launch of the 8 inch tablet, the GALAXY Note 8.0; a new era of intelligent Note technology set to re-ignite the mid-size tablet category that Samsung established in 2010. Providing unrivalled multimedia performance within a compact one-hand-grip screen, the GALAXY Note 8.0 has the power and advanced technology to evolve the tablet experience and ensure you achieve new levels of efficient multi-tasking while benefitting from superb voice call functionality. Furthermore, the intelligent S Pen brings together the latest innovation and the ease of using a traditional pen and paper; creating a sophisticated mobile experience that will enhance life on the go. 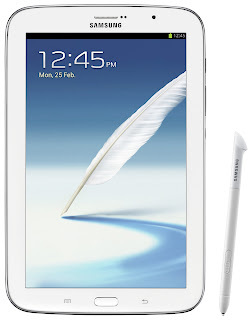 At the core of the GALAXY Note 8.0’s innovative solutions are beneficial functions, including multi-window options to split the portable 8inch screen and allow optimal access to a number of live applications; a new generation of Samsung’s intelligent S Pen with advanced usability; access to a suite of S Note templates and tools that allow you to create, edit, manage and share everyday documents; the Samsung “reading mode” technology to enjoy e books with optimized resolution, video and voice calls＊. In addition, a suite of exciting new content and services are pre-loaded for users at no additional cost including, for the very first time on Samsung GALAXY tablet, the innovative Flipboard, and Awesome Note. Multi-tasking is extended to phone calls＊. Pop Up Note allows you to access S Note at any time to keep track of key actions and Pop Up Video ensures you can keep surfing the web whilst chatting – content windows can be easily resized by pinching to enlarge or reduce. You can read the full press release on the Samsung Mobile website.